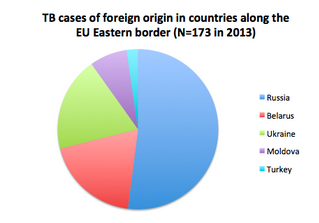 Research indicates that post-Soviet migrants account for a mere 1.7% of TB incidence across the EU border. Portraying migrants from post-Soviet states as diseased may contribute to their already negative perception in Western Europe and will further strengthen prejudice against this group. Last week, Mario Raviglione, director of WHO's Global TB Programme, singled out Belarus and parts of Russia as being part of a developing "disaster situation" due to the high rates of multi-drug resistant tuberculosis. He warned that migrants from these countries pose a threat to Western Europe, where multi-drug resistant tuberculosis​ ​(MDR-TB) is exceedingly rare. The good news is that these fears are exaggerated. Research indicates that post-Soviet migrants account for a mere 1.7% of TB incidence across the EU border. What is more, Belarus may pose less risk to Europe than countries like Moldova, where overall TB rates (although not MDR-TB rates) are more than twice as high. Unlike Belarusians, Moldovans no longer need to obtain Schengen visas for short-term visits. Research to date suggests that imposing medical testing requirements for long-term visa applicants from post-Soviet states, a practice followed by many western countries, leads to nothing but stress and bills for the applicants. Belarus still has much to worry about. Between 1990 and 2000, TB incidents nearly tripled. Alarmingly, one third of the newly diagnosed and two thirds of returning TB patients have MDR-TB. This is the highest MDR-TB rate ever documented in the world. MDR-TB infections continue to grow, despite significant efforts to curb them. MDR-TB is a form of TB resistant to at the least two of the most powerful drugs currently available. With ordinary TB, patients get better after a few weeks or months on mainstream antibiotics. With MDR-TB, patients require second-line drugs, which are much more expensive and less effective. Fewer than half of MDR-TB patients are ever cured. High incidence of MDR-TB speaks to the poor management of TB patients. Drug resistance evolves when patients receive some treatment, but are not cured completely, for example, because they forget to take their medicine, leave treatment programmes early, or take the wrong drugs. MDR-TB strains can then easily spread to other people. At first glance, Belarus’s health care system has performed reasonably well. The WHO ranks it 53rd out of 190 countries, which is the highest ranking in the CIS. The number of per capita hospital beds and per capita physicians in Belarus is much higher than in the West. However, Belarus continues to use technologically backward practises, ones common to all countries of the former Soviet Union, which may have contributed to the alarming rates of MDR-TB incidences. All of these countries used to conduct annual mass screening through tuberculin skin testing, which is considered an ineffective and costly diagnosis method. None of them maintained electronic databases of their TB patients. More alarmingly, noninfectious TB patients were often unnecessarily treated in hospitals and involuntarily isolated. This not only burdened the health care system financially, but also imposed a psychological and physical burden on the patients. Living conditions in Belarusian TB hospitals are often deplorable, which undermines any potential treatment objectives and encourages the infected to avoid hospitalisation. In several instances, TB patients went on hunger strikes to protest hospital conditions. Perhaps the best known case was a 2011 hunger strike by the activist of the Belarusian Christian-Democratic Party, Valery Gancharenka, who was treated at the Bogushev TB hospital. The strike prompted an investigation by the human rights organisation Viasna. Viasna found that the hospital had seen no renovations since the 1960s. The walls were reportedly covered in mould; the facility had no running hot water throughout the year. Similar conditions were reported in two other provincial TB hospitals in 2008 and in 2010. With some guidance from international organisations, Belarus’ TB programme has reached several important milestones. Among other things, Belarus revised its TB and MDR-TB treatment and control guidelines and reorganised its national laboratory network. It also integrated TB care into primary health care and increased the level of supervision for facilities delivering TB services. However, significant challenges remain. Despite substantial financial infusions, funding for tuberculosis and other social diseases remains limited. 2011 Currency devaluation made imported equipment prohibitively expensive. Salary of health workers involved in TB care remains low and does not reflect occupational risk. Doctors and nurses lack financial incentives to be involved in TB care and provide high-quality assistance to patients. As part of its Soviet era inheritance, the current Belarusian health care system is centralised. The ultimate management power lies within the central government. Even so, TB planning has been conducted at the rayon (district) level and taxes are collected locally. This produces imbalances in the quality of care and issues with funding, which regularly dries up. Greater centralisation could allow for the pooling of resources and distributing them more effectively. TB bacteria can lie dormant for months and even years, causing no illness in most of the infected. If the infected move to another country, there is some risk that the latent disease will develop into active TB in the first few years after immigration. To guard against this possibility, many western nations require applicants from the former Soviet Union to undergo TB screening prior to applying for a long-term visa. This year, the United Kingdom introduced TB screening requirement for long-term visa applicants from Belarus. The recent WHO warnings may encourage other countries to impose a similar requirement. However, a 2013 study by the researchers at the European Centre for Disease Prevention and Control focused on the 10 EU countries at the EU’s Eastern border has shown that in 2010 a mere 0.5% of all TB cases indeed originated in the countries bordering the EU to the East. The distribution of these cases by the country of origin suggests that Belarus accounted for 0.1% of all notified TB cases (or 33 out of 47, 433 cases). Belarusian migrants present a far lesser risk to the EU than often previously assumed. While TB is indeed more prevalent among migrants, albeit primarily those who come from Africa and South Asia, another study, focused on the UK, has shown that less than a quarter of TB cases are diagnosed within two years of an immigrants’ arrival. Thus, poor living conditions in the host country, rather than prevalence of TB in the country of origin, may be driving up the numbers of migrants with TB. Indeed of combating the spread of TB, the alarmist warnings about Eastern Europeans may contribute to their already negative perception in Western Europe. Portraying migrants from post-Soviet states as diseased will further strengthen prejudice against this group. Published: July 14, 2014, 9:48 p.m.
Last updated: Oct. 23, 2014, 9:32 a.m.